NAIROBI, Jan 10 2014 (IPS) - Thanks to antiretroviral drugs, HIV-positive children can now live to adulthood. Yet a significant number of children living with HIV in Kenya will die due to delay in receiving anti-retroviral drugs (ARVs), inconsistent use of ARVs or, simply, no ARVs. Seven-year-old Melvis* lives in Kisumu Ndog, in Nairobi’s sprawling Kibera slum, with his 75-year-old grandmother, Sabina. His mother died of AIDS three years ago. He has been taking ARVs most of his short life. “Keeping him on medication is difficult,” says Sabina. Sometimes the clinic runs out of drugs, sometimes granny forgets to give him the pills, which must be taken every day at the same time to keep the virus at bay. “My memory is not as good as it used to be,” she says. And Melvis’ drug regime requires a good memory: daily, but at different times, he must swallow three ARV pills, two of the antibiotic to prevent opportunistic infections, and sometimes anti-malarial pills. Drug containers are colour-coded to help his illiterate granny. “Even with the colours, I still get confused,” she laments. In its sixth Children and AIDS Stocktaking Report launched on Nov. 29, the United Nations Children’s Fund (UNICEF) says that, although there are more children on treatment, children are not benefitting as much as adults from progress made in low and middle-income countries in ARV coverage. In these countries, ARV coverage for children under 15 years has consistently been half that of adults – 34 percent of children compared with 64 percent of adults in 2012. “There is no technical justification why infants and young children cannot benefit equally from HIV prevention and treatment advances in Kenya,” says Ulrike Gilbert, UNICEF HIV coordinator in Nairobi. Dr. Lucy Matu, director of technical services at the Elizabeth Glaser Pediatric AIDS Foundation, explains that Kenya has some 4,700 sites offering prevention of mother-to-child transmission, but only 1,800 providing antiretroviral therapy (ART) services for kids. “We have many more sites diagnosing children than sites where they can access ART services,” she says. HIV diagnosis for children under two requires specialised laboratories, of which there are six in the country. “Correct and timely HIV diagnosis for young children has been slow,” Matu told IPS. This shortage of paediatric treatment sites partly explains why, among 150,000 children eligible for ART in 2012, almost six out of 10 were not receiving it, according to the Progress Report 2013 of the Joint United Nations Programme on HIV/AIDS (UNAIDS). At six percent, HIV prevalence in Kenya is in moderate decline, says UNAIDS, with 13,000 newly infected children in 2012, down from 23,000 in 2009. In the absence of ART, one-third of HIV-positive babies will die before their first birthday and more than half before their second birthday. Some parents and health workers believe that the survival of HIV-positive children is so poor that their early death must be accepted, Matu adds. The UNICEF report lists several barriers to paediatric ART. Among them are limited availability of fixed-dose ARV combinations, poor palatability of recommended drug formulations for infants, lack of technology to test HIV infection among children under 18 months and fewer ART options for children than for adults. 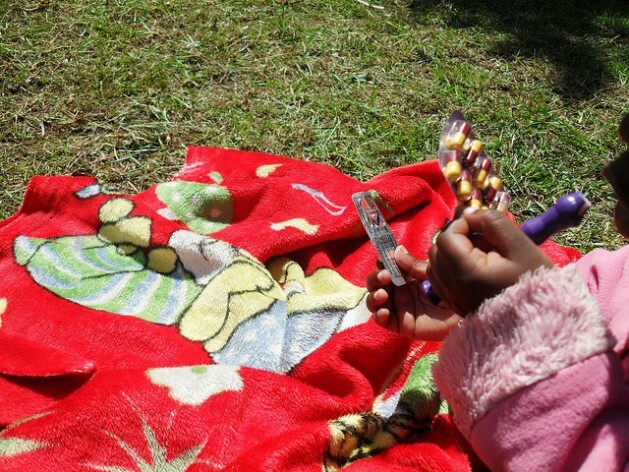 Of the 22 ARVs approved by the United States Food and Drug Administration, five are not approved for use in children and another six are not available in paediatric formulations, according to UNAIDS. Mary Naliaka, a health worker in paediatric AIDS with the Ministry of Health, explains that effective ART for kids requires a complex treatment formula. In a country where 35 percent of children suffer from malnutrition, “measuring the right dosage against the weight of the child can be daunting,” Naliaka told IPS. For children in boarding schools, the lack of disclosure hurts treatment effectiveness. “If the school nurse is unaware of the child’s HIV status, they are unable to support them,” says Naliaka. Matu says that parents, especially mothers struggling to accept their own HIV-positive diagnosis, find it difficult to take their children for HIV testing and feel guilty of passing on the virus. The government estimates that 1.1 million children have lost one or both parents to AIDS; Many live with their elderly, illiterate and poor grandparents. Although the Ministry of Health plans to reach 40 percent of caregivers of orphans through local community health workers who will teach them HIV care and provide food parcels, this help is yet to reach Sabina and Melvis. *Not his real name. Family name omitted to protect privacy.